Ach, hallo Herr Injury Bug...fancy meeting you here again I should say. Okay no, enough with the joking, because this situation that rears it's ugly head time and time again each and every season has finally put me at the end of my pitiful rope (and if you can name that movie, good on ya). Usually I expect this to come around right after the January window slams shut in our face after we customarily still refused to address the issues of the previous months, but this stupidity occurring in September has just about done me in. While I can sit here and blather on about how this could all have been avoided, truthfully, what is the point considering anyone under the sun knows it could have and should have been avoided. "But wait, Andrew, we are over stocked in midfielders, so why are we pissed off about Aaron Ramsey and Mikel Arteta being out?" - I'll tell you why, because our only fully fit TRUE midfielders currently are Abou Diaby, Frances Coquelin and Mathieu Flamini!! Jack Wilshere may be ready for the Chelsea match, or even today against Galatasaray, but with his ankle that is apparently made of the clay that comes with Cranium, no one can possibly consider him fully fit at any given time, ever. Now that I got the rant out, the truth of the matter is, what a difference a day would have made if we stumped up that extra 5million pounds for William Carvalho; what a midfield Caesar he would have made. With Rammer and our not-so-captain captain crocked, it will certainly be interesting to see who Wenger goes with in midfield today against our fabulous friends from Istanbul at the Emirates in under two hours time. Against a battling and aggressive midfield that can call upon the creative genius and general attacking chicanery of Wesley Sneijder, there is no possible way that Flamini, Diaby, Coquelin or even Wilshere can guarantee that the midfield battle will be one, or that Sneijder can be kept silenced all night. 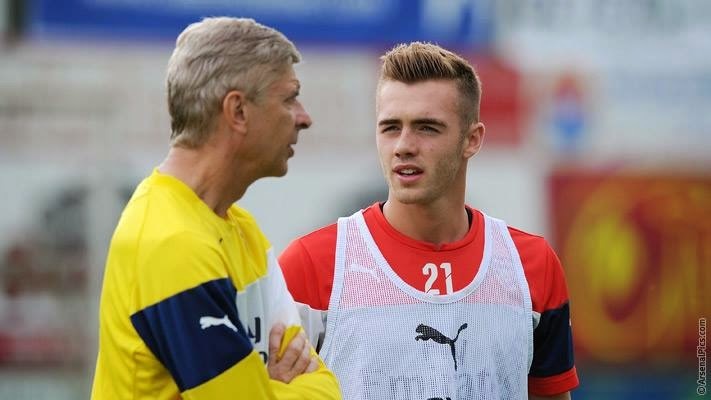 It may not be ideal but what about shifting Calum Chambers into the holding role for the duration of the evening? Though the Southampton Academy product came to us as a highly touted right-back who was equally adept at featuring in the center of the defense (as we have all seen already) as well as on the left; but in his early days at the club, Arsene Wenger went on record stating he thought his future could be a a holding midfielder. Tall, strong, possession a brilliant engine and technical ability as well as being able to pick out a decent ball, Chambers has all the attributes to put in a shift in that oh so infamous position for us. Granted, with our paper thin depth at center back, Chambers has seen plenty of time at the back as well as at right-back given Mathieu Debuchy's long term injury. The beauty of Chambers, however, is his versatility. To be honest, can anyone really expect any of the available midfielders to be able to wrestle any sort of control away from our opponents? Jack is too forward thinking, Diaby is made of tissue paper and is also too forward thinking, and Flamini is just relatively useless. With Hector Bellerin being fast-tracked into the first-team as a right-back, and with Champions League really needing to be second priority behind our Premier League campaign, tonight would be the perfect time to give Chambers a shot in midfield and Bellerin another go at right-back. In all honesty, it's likely that no one could have predicted the sort of situation we now find ourselves in for the next month. Galatasaray today, Chelsea at the weekend and all the while we really are not playing all that well yet. While that is certainly reason to be hopeful, the quandary that is now our midfield situation could cause us a bigger headache than first anticipated. Calum Chambers may not be the ideal man to come into the midfield, but at least it's something...something better than Mathieu Flamini anyway. And look on the bright side, one of two things can happen; 1. he will end up being brilliant and give us a positive selection headache, or 2. he ends up mucking it up and Arteta will be back in three weeks to do an equally as poor job. Truthfully, what's the harm in trying, especially in a competition that not only do we have zero chance of winning, but a competition we should not be trying to win in the first place.